A hitherto unknown Russian, believed to have intelligence connexions in Africa, has made contact with the Guinean government in a bid to save the Russian bauxite and alumina concessions in the country. The move, orchestrated in Paris this month, is the first indication to date of French moves afoot to intervene for regime change in the west African republic of Guinea — with methods and motives associated with the infamous murder of Congolese Prime Minister, Patrice Lumumba, in January 1961. Then, Belgian officials, backed by the CIA and a White House assasination order, did the deed, claiming justification from Soviet support of the popular nationalist figure. This time round, the Russian interests are causing a switch in sentiment. 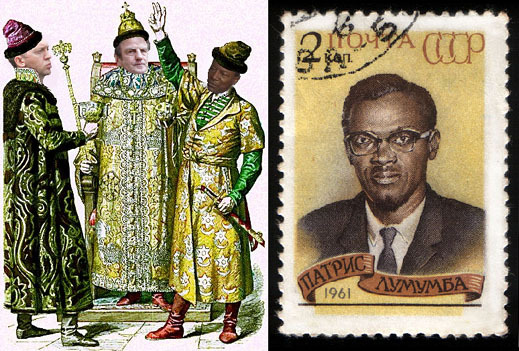 Victor Alexeyevich Boyarkin (literally translated into English, the name means “belonging to the boyar”) was in Paris a few days ago, according to local sources, where he was introduced to Guinean Government officials as a close associate of Oleg Deripaska (see boyar figure to left), the chief executive and controlling shareholder of United Company Rusal. Boyarkin has an office and secretary at Rusal headquarters in Moscow, and company sources confirm that he heads a department there. During Deripaska’s visit to Paris to meet with French banks a few days ago, Boyarkin was seen with him, and was introduced as one of the company’s top troubleshooters. Guinea, one of the world’s leading producers of bauxite, has been a vital supplier of bauxite to Russian aluminium smelters since Soviet days and during the 25-year rule of Lansana Conte. Since Conte’s death last December, and the takeover of Guinean Army captain Moussa Dadis Camara, government ministries and auditors in Conakry have been reviewing allegedly corrupt deals Conte had arranged with international mining and metals companies. In Guinea, Rusal operates the Kindia bauxite mine on a 25-year concession, and it bought the Friguia alumina refinery in 2006 for $19 million. That deal, ostensibly arranged under Guinea’s privatisation law, was revoked on September 10 by a court in Conakry, on application by the government, on the ground that it was corrupt; and that the real value of the asset was at least $240 million more than Rusal had paid. Rusal’s mines, refinery, and the rail line, port, and power station linked to them, are, together, one of the largest employers in the country. The Dian-Dian bauxite concession, for which Rusal has mining rights, but which it has yet to dig, is the largest bauxite deposit in Guinea, probably in the world. Two tonnes of bauxite make one tonne of alumina, which in turn produces half a tonne of aluminium. Put this another way — no Guinea, no aluminium. Rusal is appealing the court order returning the Friguia refinery to the state, which is preparing to re-sell it in an open privatisation auction. Chinese interests are reportedly in the running to buy. The government has also signed two contracts with the UK-based Alex Stewart International to value Friguia and other assets controlled by Rusal, according to international practice and current mining values. Stewart has also been commissioned to conduct a forensic study of Rusal’s operating records, financial reports, tax payments, and export declarations in Guinea, and determine whether a Guinean government audit showing tax evasion and other alleged fraud is warranted by the evidence. A second government lawsuit is being prepared to follow up on the Stewart reports, and may lodge a court claim to $1.5 billion. Rusal had requested a direct negotiation with Guinean leaders, and this was scheduled for Paris last week. However, Rusal then asked for a postponement until mid-November. In the meantime, Boyarkin asked the Camara government for cooling-off measures. He offered to provide a list of names of Guinean politicians, officials, and others with whom Rusal has had a financial relationship during the Conte period. In exchange, he asked for a reversal of last month’s court ruling revoking Rusal’s ownership of Friguia. Boyarkin and Deripaska have also been talking with the French investment houses over Rusal’s multi-billion dollar debts to the French, and a plan to sell Rusal shares on the Paris stock exchange as a way of raising cash to pay some of this debt back. The lead French bank involved in this scheme is BNP Paribas; Credit Suisse is also involved. Other French banks holding large sums of Rusal’s $17 billion debt include Societe Generale, Natixis, and Calyon. Bank sources are reluctant to talk about their negotiations with Rusal, and the banks do not agree among themselves over what to reveal about their financial exposure to Rusal, and how to handle it. Getting Rusal’s debts off the state-assisted French banks’ books has also involved the French government and the banks in a discussion of policy towards Camara’s government in Conakry. Sources in Conakry and in Paris reveal that the French bankers are unhappy with measures being taken by Foreign Minister Bernard Kouchner (see central figure), especially the recent Foreign Ministry order to close French schools and evacuate French nationals from Conakry. There is suspicion in Paris that Kouchner is backing one of the Guinean opposition figures, Alpha Conde (see boyar figure to right), head of the Rally of the Guinean People (RPG). Conde and Kouchner have been friends since school days. Kouchner has been attempting to rally international support for political sanctions, and possibly military intervention in Guinea. “It seems now that we can’t work with Mr. Camara and that there must be international intervention,” Kouchner announced publicly on October 4. Banking sources in Paris say they were opposed to the evacuation of nationals, and made their views plain to the French Ambassador in Conakry, and to Kouchner on the Quai d’Orsay, and have been subsequently assured that this is a temporary measure, with the French schools to reopen in January. This interval is an ominous sign for those who suspect Kouchner and Conde of plotting to depose Camara. The banking sources say they are well aware that their interests in Guinea are threatened if they are viewed in Conakry as backing two wrong horses at the same time — Deripaska and Conde. At the same time, Rusal has been hinting in Moscow that it is lobbying for a show of Russian Foreign Ministry condemnation of Camara for his treatment of Rusal, as much as for the killings and human rights violations in Conakry on September 28. The Russian Foreign Ministry spokesman Andrei Nesterenko says there is no such linkage. He said that “like the diplomatic establishments of other countries, the Russian Foreign Ministry supports Russian business abroad.” However, he cautioned this does not mean that the Foreign Ministry will get involved in commercial disputes involving Rusal and the Guinean authorities. A trip to Moscow by the Guinean Foreign Minister, Alexandre Cécé Loua, had been agreed for the first week of October, Nesterenko confirmed. But this was put off at Conakry’s request.